Battle Ready Swords for sale are made for a variety of uses. These battle ready swords feature a functional blade and are built for stage combat and reenactment. All types of styles are available including fencing swords for sparring that feature a button tip and medieval reenactment swords with unsharpened flat blades. Buy all kinds of functional battle ready swords for reenactment, theatrical use or display on sale now. Practical Hand and a Half Albrecht Swords for sale are 43 ¾ inches in all and weigh 2 ¾ pounds. These functional non-pointed and un-edged swords are crafted to the requirements of stage combat and reenactment societies featuring 1/16th inch wide edges and a rounded tip. The fully tempered 34 inch blades feature a fuller and are crafted of 1065 high carbon steel that is hardened to 50HRC. They are hardened to provide resilience, protect against brittleness and permit edge notching to only acceptable levels. These Albrecht Swords have a 6 ½ inch hand and a half handle. The guard is 0.21 inch thick and 1.75 inches wide. They have a point of balance at 4 inches and point of harmonics at 23 inch. The tip is 0.51 inches wide and 0.19 inches thick. The scabbard has adjustable belt rings for a vertical or horizontal carry. The scabbard feature and glass-filled resin construction to eliminate swelling and diminish blade corrosion. Buy the Practical Hand and a Half Albrecht Swords for $229.99. 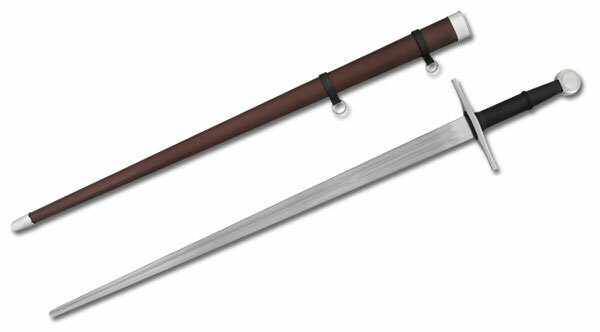 Albrecht Swords for sale are 44 ½ inches in all and weigh 3 ¼ pounds. These popular hand-and-a-half swords are inspired by a real 15th century sword that was thought to be the sword of Albrecht II of Austria. They feature a functional and sharpened 34 ¾ inch 1566 steel blade. The classic medieval design includes a flattened diamond blade section and a cruciform hilt. 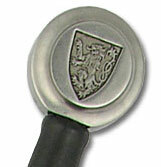 The pommel is engraved with the Lion Rampart, the emblem of the House of Habsburg. The blade fuller features the Passau Running Wolf guild mark and a marigold maker mark. The grip and the scabbard feature a genuine leather wrap. The hand and a half length handle is 10 inches. These swords have a point of balance at 5 ½ inches and a point of harmonics at 21 ½ inches. They have a 2 inch guard width and 0.24 inch guard thickness. The tip is 0.9 inch side and 0.20 inches thick. Buy the medieval Albrecht Hand-and-a-Half Swords for $299.99.